Some of the highlights of the conference were the breakout sessions feauring first-hand accounts of dealer experiences with FIN. Wyatt Apple from Critchfield Pacific Inc (CPI) highlighted the benefits of using a combination of the FIN Appliance and FIN Builder to automatically generate unitary graphics, navigation, custom AHUs, central plants, and floor plans. The final day included a product tradeshow with lots of great hardware and live demonstrations of the appliance and FIN Technology. 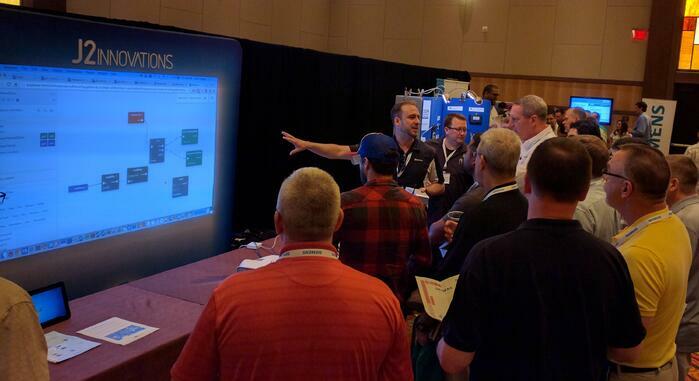 Jason and Scott were busy showing off how FIN helps dealers get things done faster and better on a 90" screen. To see some photos from the show, check out our Facebook album.